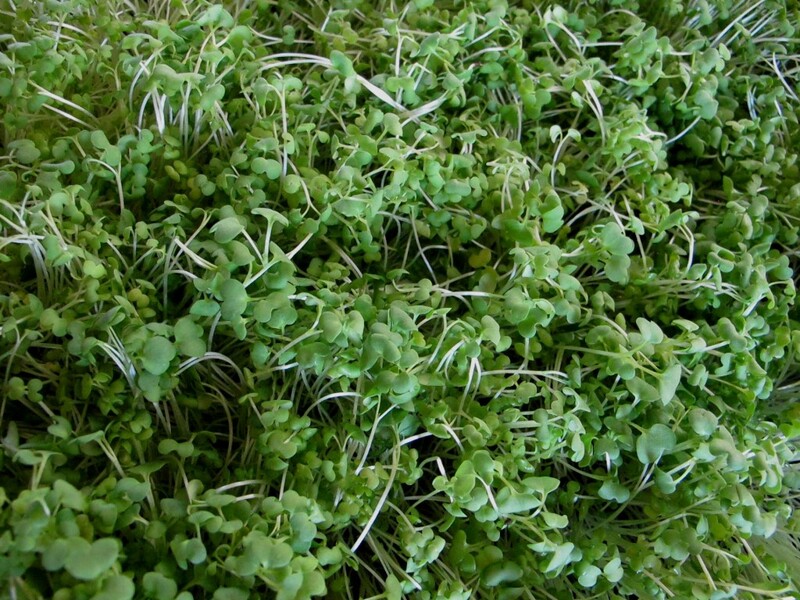 Micro-greens are early versions of most vegetables, leafy greens, and some herbs. They aren’t the same as sprouts. They’re more like baby, leafy-green houseplants that you can eat. Sprouts are grown in water, micro-greens are grown in soil and harvested when the leaves open, but before they mature. The main difference between the two is the size of the root and the length of time before harvest. Although neither take long to grow, sprouts are quicker to reach harvest size. I love micro greens — partly because they’re fun to experiment with and a nice diversion from regular vegetables, but also because of the vibrant colors, zippy taste, and nutrient density. They pack a lot of low-calorie punch in their tiny leaves and stems. These feisty little mustard plants start with a sweet, mellow taste, but finish with a peppery bite. I sprinkle them on salads and tacos, but when I want full-on, zippy flavor (a touch wasabi-ish), this pesto recipe is the best. Serve with grilled salmon or pasta. 1. Place micro greens in a food processor. Add garlic scapes (or, peeled and coarsely chopped garlic cloves), pine nuts, and lemon juice and pulse a few times to chop and blend well. 2. Add the Parmesan and slowly add the olive oil while pulsing to reach the consistency you desire. I don’t like pesto to be overly oily, so adjust to your liking. Taste and add a pinch of salt if needed. Pesto is user-friendly. Be creative. Were you wondering what those curly-cue things were in your CSA box this week? Garlic scapes are an early summer treat and disappear quickly. Enjoy them while you can. They’re the bright green, coiled, twisty, flowering stalk that launches forth from a garlic plant. Although you can use them in everything from salads to stir-fries to omelets, the mainstay garlic scape recipe is a pesto. Dorie Greenspan has a wonderful post using almonds in the mix, but most recipes fall back on the typical pine nut and olive oil combination, which is what I’ve done. Put the garlic scapes, lemon, pine nuts, half the cheese and half the oil in a food processor, blend well. Add the rest of the oil and cheese (to taste) and continue processing. Taste and adjust as you like, season with the salt. Serve with pasta or over thick crackers or bread (all gluten-free in my case). 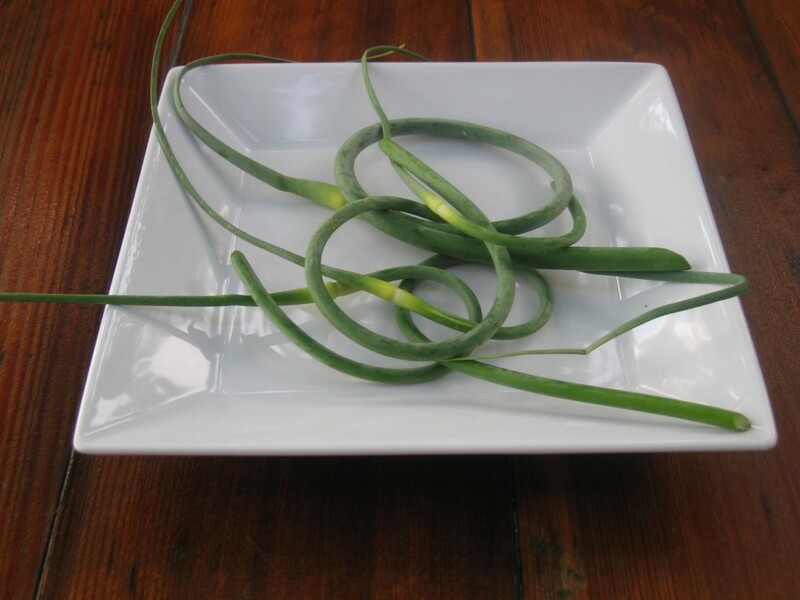 If you only have a few garlic scapes, adjust the recipe to accommodate what you have.